Every time I get a notification that there's an update, I get my hopes up when it's a 1.14 update. Same here. CurseForge needs per-version notifications. When Forge has a proper release, sure. Fabric does not support 1.13 and I do not support Rift. Fabric and PluginLoader are only for 1.14 snapshot? Their curseforge page only lists downloadable files for 1.14. how do I get the ones for 1.12.2??? You don't. Fabric is only for 1.14 snapshots and is only needed for the 1.14 snapshot versions of Hwyla.
" Fabric is only for 1.14 snapshots and is only needed for the 1.14 snapshot versions of Hwyla. " No because anybody with half a brain can figure that out considering "fabric" is in the file name. I partially agree @TehNut - I had no idea what Fabric was until I started seeing emails with updates to several mods (including this one) where a 1.14 update was done using Fabric. From what I could tell, Fabric is very new (like it's < 2 months old right?) - the larger audience who looks for mods will have no idea what that distinction is for and will just click on download not thinking/knowing any better. After all, when I hear "fabric" I think of cloth, materials, garments, etc. not another Launcher. :-) In time, if Fabric is successful, the word will get out and it will be as common as all the other launchers. Hope that helps! I still need to devote some time into Fabric and what it offers different than Technic, Twitch, Forge and other Launchers to see why it is needed or its benefits. Isn't the mod made for those of brains? This wasnt nice of me. I have HWYLA configured the exact same way in 1.11.2 and 1.12.2 but the latter does not show block id. How can I get the ID's to show up in this format; (#0001/0) for stone or 1:0? I have tried F3+H but didn't work. All I'm getting right now is something like @0. Use the string ID. Numeric IDs are not used anymore. Are you saying that numeric ID's are not in the game anymore or they are just not commonly used? I find it hard to believe that anyone using WorldEdit to replace stone bricks with mossy stone bricks would type that all in each time; //replace minecraft: stone_brick minecraft: mossy_stone_brick. 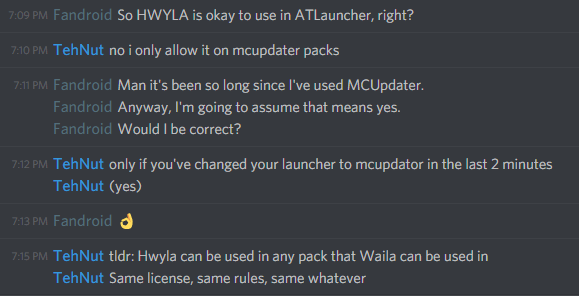 If that's the case then I guess I don't have a use for Hwyla anymore. Then I guess you don't have a use for hwyla anymore. Tab-completing is your friend for those situations I'd say. Hwyla and (MCA-1.12.x-5.3.1-universal) is in conflict.when MCA needs to resurrect a villager, at the moment when the villagers’ remains/toy are put down, the whole game will crash and cannot enter the game archive again. Can't do anything without a crash log. This is probably on their end, however.